NEW YORK—Seventeen-year-old Cici Ma, a Chinese-American dance student from California, made a six-hour journey from San Francisco to perform at the May 12 gathering at Union Square, where hundreds of people from around the world celebrated the 24th anniversary of the first public of teaching of Falun Gong, a traditional Chinese spiritual practice. It was a hot and bright afternoon as Ma and another student, who both attend the Fei Tian Academy of the Arts California, performed a classical Chinese dance routine, including challenging flips and gestures, on a temporary stage in the center of the square. “I want to let people see the beauty of traditional Chinese dance, the traditional culture,” said Ma, who was born in Beijing and began practicing the meditative discipline of Falun Gong when she was twelve. In 2010, she emigrated from China and began attending Fei Tian. Falun Gong became publicly known in China, and later around the world, in 1992, when its teacher, Li Hongzhi, held a series of lectures in a schoolroom in his hometown of Changchun on May 13. Like many other qigong practices popular in China at the time, Falun Gong featured a regime of meditation exercises, but what Li taught was free, open to anyone and everyone, and placed emphasis on moral self-improvement through serious, self-driven cultivation of the mind. Such concepts were familiar to many Chinese by way of ancient Buddhist and Taoist traditions, and Falun Gong quickly became a household name. In 1999, the Chinese government estimated that 70 to 100 million people had taken up the practice. “The floor is not really convenient,” said Ma, referring to the coarse ground of the square, separated from her feet by just a thin carpet when performing—a far cry from the smooth wooden boards she and her classmates use at the Fei Tian Academy. Despite ongoing persecution by the communist authorities in China, Falun Gong has been welcomed in dozens of countries worldwide, reflected in the many languages—German, Czech, Romanian, and Korean, to name a few—that could be heard among Falun Gong practitioners at the scene. “I follow truthfulness, compassion, and tolerance,” said Ma, repeating the core virtues enshrined in the teachings of Falun Gong. Other performers, including teams of muscled young men performing a Chinese dragon and lion dance, captivated the crowd. In another piece, the powerful soprano of a woman singer versed in the technique of bel canto penetrated the air. 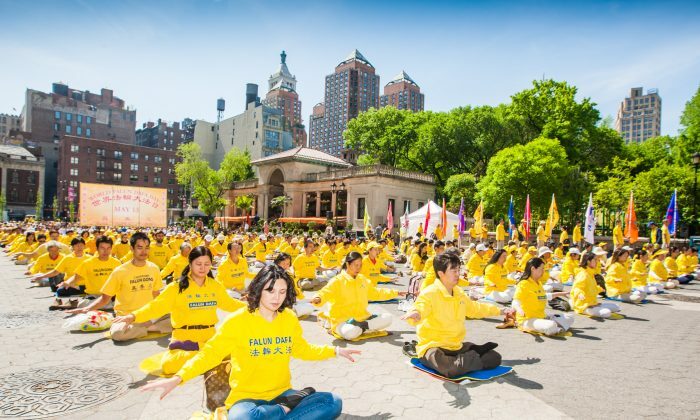 Over 9,000 Falun Gong practitioners, both local and visiting, are in New York for several days of events surrounding the May 13th anniversary. Aside from performances and rallies held at public offices to raise awareness about the 17-year persecution in mainland China, practitioners have set up large-scale meditation groups in New York’s parks. In the morning, before the performances began, hundreds of people lined up in the square to do the Falun Gong exercises, while practitioners distributed materials about the practice and the persecution to passers-by.